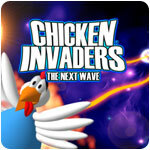 Chicken Invaders 2 Game Review - Download and Play Free Version! The egg-dropping alien chickens are back and you must protect Earth from their vile schemes! In the first chapter of the Chicken Invaders saga, you defended earth against an invasion of intergalactic chickens seeking revenge for the oppression of their earthly brethren. However, as you were frying the last fleet of chickens trying to scramble Earth, the true scale of the problem became apparent: the first invasion was simply a precursor to the chicken's main assault! Their master plan now becomes clear: to invade every planet in the solar system and make sure that it is inhabited only by chickens! The time has now come to don your Teflon-coated helmet and make the biggest omelette ever as you continue your adventure in Chicken Invaders 2: The Next Wave. Only you can win this battle. Will you be able to pulvarize this poultry or will be charbroiled in the process? More Chicken Invaders! More Chicken Invaders! If you are up for the challenge, try the new Chicken Invaders 3 Revenge of the Yolk - sure to scramble your brains as you fry the latest chicken menace! Chicken Invaders 2: The Next Wave is an arcade shooter that picks up right where its predecessor left off. Chickens are once again invading Earth and it's your job to pilot a spaceship to take them out and save the world. You'll take on increasingly difficult waves of chickens and asteroids that threaten to destroy Earth. You can face the task alone or play with a friend as you face the chicken menace. Goofy graphics and sounds add an interesting touch to the good gameplay. 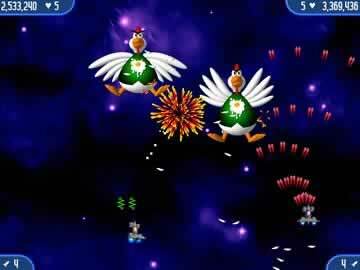 The gameplay at the heart of Chicken Invaders 2 is very similar to other arcade shooters and the original Chicken Invaders game . You control a spaceship at the bottom of the screen that can be moved in any direction. The enemies sit at the top of the screen, and its your job to eliminate them. However, you'll have to be quick and alert to dodge the eggs they drop. If you get hit by an egg, you lose one of your lives. Chickens drop a drumstick and coins when destroyed that you can collect to earn a powerful missile that can destroy an entire wave of enemies, a present that will change your ship's weapon, or a powerup that will make your current weapon stronger. 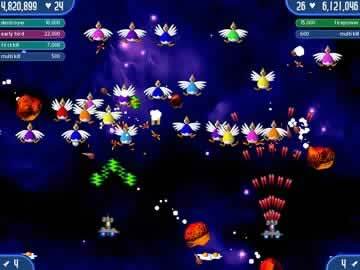 There are 110 waves of enemies and asteroids you face in Chicken Invaders 2. Some waves have you destroying the chicken invaders (who are organized in different formations throughout), while others have you dodging deadly asteroids bouncing around the screen. Every tenth wave consists of a boss encounter against a smaller number of more powerful enemies. While many of these waves are fairly similar to one another (or even identical), Chicken Invaders 2 does a good job of varying the enemies and asteroids in such a way that it doesn't feel like the exact same thing every wave. Chicken Invaders provides two difficulty levels to choose from, giving you the ability to tune the game to a level more suited to your skill. Additionally, the large number of waves brings a continually increasing difficulty. The game strikes a good balance between providing a challenge and being too easy. Similar to the gameplay, the controls are fairly simple. The spaceship you control is moved with the mouse. You fire with the Left Mouse key, and shoot missiles with the Right Mouse key. The controls are given to you before you begin the game, and simple enough for anyone to learn or use. Unlike the original game, you also have the option to customize the controls to your liking. One issue with the controls is needing to hit the same button repeatedly to fire. It becomes tiring and repetitive to have to hit the same button over and over. While the visuals of Chicken Invaders 2 are hardly cutting-edge, they are on par with other games in the same genre (and the original Chicken Invaders). They also add a somewhat humorous or goofy element to the game. The portrayal of the enemy as chickens and the dropped drumsticks and coins when they are destroyed keep the game a lighthearted affair. The various simple sound effects also play their part in bringing that feeling to the game, although they may get annoying after hearing them enough times. One downside to Chicken Invaders 2 is the repetitive nature of the game. There are only asteroids and a few types of enemies that you deal with throughout the waves. Additionally, many waves are very similar or even the same. However, the waves are varied and organized in such as way that it helps make it feel a bit different and not as boring. On top of that, playing with a friend (each of you controlling one ship) or working towards new high scores to upload can help offset the monotony, and people really into arcade shooters may not be bothered by the repetitive elements found in these types of games. Overall, Chicken Invaders 2 is a good arcade shooter game. It doesn't really bring anything new to the genre, but there's solid gameplay at the core and it's not overly repetitive. The options to play with a friend and upload high scores are great additions to the game. If you like arcade shooter games, you may find this very fun and addictive. Even if you don't, Chicken Invaders is a good game that's worthwhile for anyone to at least try out. Player created video showing the first few levels in 2 player mode.